Season's Greetings! Whether you are shoveling snow off your driveway or still enjoying mild weather for the winter, the coming of the winter signals holidays and family time globally. NSF brings you a special assortment of book reviews, reflections, and stories to read and reflect on by the fireplace during this slightly calmer family period. We bring to you two book reviews: one on the theme of self-improvement and another on the theme of volunteerism and global education. Both themes are close to the heart of many NSF volunteers, and we hope you can gain some interesting insight from our thoughts. On the same topic of volunteerism, we bring to you an interview of Bharath Ram, a high school senior who used his interest in bharathnatyam to raise $4800 for NSF India Scholarships. We found his experience inspiring, and encourage all NSF community members to read his story. All NSF students can find their own volunteer voice through Dollar-A-Square. 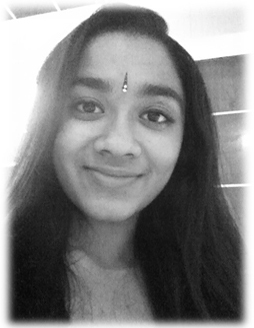 Next, we would like to introduce Malavika Kannan, our newly recruited newsletter editor. She shares a reflection on a quote that particularly got her thinking, and ties into her experiences with NSF. If you hunger for pondering deep thoughts and life quotes, Malavika's article is some great food for thought. Finally, the regional competitions are just around the corner. If you are interested in competing, this is the time to sign up and crack open those books. Once again, we would like to remind everyone that we want your feedback and input- we want these newsletters to cater specifically to your interests. We would greatly appreciate hearing your feedback on the new idea of book review articles, as well as any book suggestions for the next newsletter. We also love reading and sharing reader submissions to the NSF community, and encourage all NSF aspiring writers to take advantage of this opportunity. One reader submission is included in this newsletter, and we plan to include more in the next newsletter as well. With your input, this newsletter will be a collection of articles by and for the NSF community. Bharath Ram, a high school senior from San Antonio, TX, recently raised $4800 for the India Scholarship fund with a dance performance. NSF Newsletter Member caught up with him to get the details on his generous act. Ramya: Tell us a little bit about yourself. Bharath: I am a seventeen year old, born and brought up in San Antonio, Texas, USA. I am currently a senior at Health Careers High School. My parents are from Karnataka, India. Besides dance, some of my hobbies include playing the violin (Western and Carnatic), reading, Taekwondo, and tennis. R: How long have you been studying dance? B: I started learning dance when I was 6 years old. I have been learning from various eminent dancers in USA and India. On and off, I studied for 8 years before having my debut performance in 2011 right before entering high school. I have been giving professional performances in India and America since then. R: What gave you the idea to raise money for NSF through your dance performance? B: I have been initially participating and now volunteering for local NSF events. My father also happens to be the local coordinator for NSF. All the while, I am familiar with the cause and the intent of NSF. I am firm believer that nothing can impact more to an individual life and well being than providing education. When the idea arose that I should use my dancing capabilities to raise money for a charity, NSF was an obvious choice and a no-brainer. R: Which NSF contests have you participated in? Which have been your favorites? B: I have contested in almost all of the NSF contests: math, spelling, geography, vocabulary, essay, and public speaking. My favorite one is Math Bee. R: How did you get the word out about your performance? B: I approached my donors through various means. These include the local TV news cast, fliers, community news feeds such as Sulekha.com and saconnect, Facebook, e-mail, personal contact through phone, and word of mouth. R: What are your hopes and plans for your future? B: I plan to continue to dance irrespective of my chosen profession. Currently, I am applying for college and wish to become a neurosurgeon. Thank you Bharath for answering these questions. We at NSF would like to applaud your generosity and your talent, and know that you will serve as an inspiration to all in the NSF community. India, as a country, has developed amazingly in the last few decades. We've progressed from being a poor country of mainly farmers to competing at the global level as an industrialized economic giant. However, places still exist where people live meager lives, neglected by society at large, dreaming of a better existence and more consistent happiness. 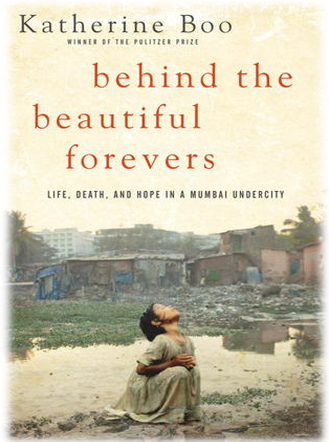 It is about one of these places – namely the Annawadi slum located near the Mumbai Airport – that acclaimed author Katherine Boo chose to write her first book, titled Behind the Beautiful Forevers. This non-fiction work gets its title from the advertisements plastered near the slum that read "Beautiful" and "Forever," and chronicles the lives and conflicts of a series of people bound to each other and the Annawadi slums. Boo calmly, but with hidden emotion, conveys to readers not only these people's routines, but also their hopes and plans for the future. Prominent characters include Abdul, a dutiful young garbage trader who is wrongfully accused of a crime; Manju, a studious, caring teen aiming to escape the slums and graduate from college; Asha, a prideful mother who will do anything to gain more power and prestige; and Fatima, a cantankerous old woman with a fiery temper and a grudge against Abdul and his family. Boo weaves together the tales of these characters and many others to show that while Annawadi is certainly not beautiful in the conventional sense, and life in its confines is fraught with various perils, prejudices, and corruption, the everyday existences and valiant struggles of the slum's occupants hold a certain grandeur of its own. 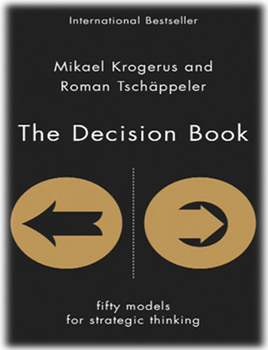 While idly looking through the bookstores of Boston, I found this one small book on optimizing decision making: The Decision Book by Mikael Krogerus and Roman Tschappeler. The book is filled with succinctly described models of our thinking paired with relevant visuals. What made this book unique to me was its presentation. Each model was simplified down to its core, and visually presented in a way that made it seem simple. This allowed it to easily convey a clear message on how to boost mental performance. This creative way of presenting information appealed to me and really stuck with me. One example visual model is shown. 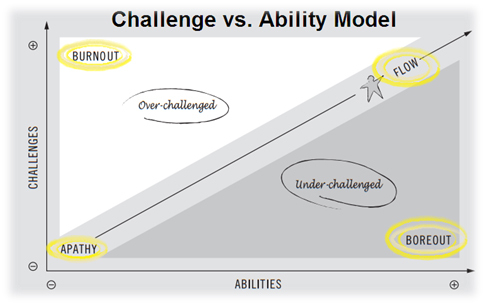 This model looks at the difficulty/challenge of a task vs. our abilities to complete them. Our feelings at extremes of the quadrants include apathy, burnout, boreout, and flow (wanted). The visual shows that we would optimally want to learn and improve along the diagonal line for our highest happiness, and optimum path to flow. While I particularly enjoyed reading this visual model, the book also had its limitations. Not all models in the book seemed as useful as the one above. Because each model was simplified down to its core, it might not accurately capture the details or nuances. Furthermore, if you are looking for a book more grounded in experimental results, this may not be your pick. This book is great at presenting and conveying information, but doesn't explain the background research grounding it. If you are looking for specific experiences and applications of people, this may not be what you're looking for. However, if you are just looking to be inspired and come across interesting abstract concepts presented in interesting ways, this is perfect. All in all, I would recommend this book to readers who are interested in psychology, the brain, education, learning, motivation, or self-improvement. If you are interested in learning about some interesting concepts of these topics in visually presented ways that make an abstract point clear, you would really enjoy this book. However, if none of those topics interest you, or you are looking for more fact-based research or concrete experiences and stories, this may not be your cup of tea. Personally, I found myself sitting in a bookstore for an hour skimming through this book, excitedly showing my friend its visuals and sparking interesting conversations on how it applied to our learning in college. There has been one quote that I stumbled across quite unexpectedly, but it has changed my perception of everyone, everywhere, everything. It is Francois Rebelais's last words: "I go to seek a Great Perhaps." I assumed, at first, that the Great Perhaps referred to whatever came after life, maybe even beyond the traditional concept of afterlife. But if that were the case, the Great Perhaps would not be such a great perhaps, because it would become an entity, a nameable thing, something to lose belief in. No, for it to be a Great Perhaps, it had to be changing, inconstant, something entirely impossible to pinpoint. When I was in third grade, I first started participating in NSF. I have always been a studious girl, and I found NSF to be my outlet to learn more and more about the world. My favorite competition was, and still is, Vocabulary. All of a sudden, I saw a definitive Perhaps- the world of language and linguistics, of endless possibilities formed by a mere 26 letters. NSF encouraged me to delve into the uncharted, untrodden territory of my Great Perhaps. I could learn all the words in the world. I bet I could. Except there was the catch- all the words in the world was its own Great Perhaps. The Oxford English Dictionary lists more than 250,000 distinct words, not including many technical, scientific, and slang terms. More than- not including. I had not discovered the Great Perhaps. I had, in fact, stumbled into an endless labyrinth of Perhaps. So I decided that the Great Perhaps was something that was a legitimate and definition-Perhaps, that changed from person to person, that would remain an enigma that could never be escaped. Initially, this was hard to accept, because for me, the girl with the book, the Great Perhaps had always been to learn everything there was to know, to dive into the Ocean of Perchance of knowledge. But I had discovered, from the challenging NSF material, that the Great Perhaps was one whose boundaries could be pushed, but the Great Perhaps could never be fully overcome, understood. I also realized that succeeding in NSF was not based on only factors of the Perhaps. It undeniably involved a factor of luck in the final rounds, but beyond that, it was really Something else that allowed one to succeed in the visionless eye of the Great Perhaps. That Something with a capital S was hard work. In the Great Perhaps of my world, the values of hard work from NSF remained a constant. There were no maybes or two ways about it- being diligent and determined was the only was to succeed. Maybe I could not learn everything, but I sure as well could learn what I could. I was motivated to study harder, go the extra mile. To review the word list one more time, to look up just one more Greek root, to turn the dictionary one more page. With this knowledge- that my Great Perhaps could not be overcome, but succeeded in with hard work, I started seeing the Great Perhaps everywhere. I saw it in my other passions, like art and writing. I saw the Great Perhaps, most of all, in the thought of my own future. But I had learned not to be daunted by it- instead, I had learned to cope with my Great perhaps. I will never understand the Great Perhaps, but NSF has taught me to accept the Great Perhaps as just that. As the end of April rolls around, the anticipation and excitement builds in the Indian community. All of us are practicing spelling words, solving math problems, studying for various contests. "I'm so excited! The Math Bee Level 1 contest is tomorrow!" squeals my 7-year-old sister, jumping up and down. It's time for the annual NSF Regional contests. This year was the 6th year I had participated in NSF. But there's no such thing as "getting used to it" – every year is a new and thrilling experience! Because NSF is not about just winning, everyone benefits from friendly competition. Having participated in many different contests over the years, including math (every year), science, essay writing, vocabulary, spelling, and geography, I like to give advice for preparation to those younger than me, eagerly waiting to write the exams. in the room where we'll be taking the MB3 test, I think, Wow. What a great cause we are contributing to, giving scholarships to underprivileged students in India, and here I am with my peers, learning and excelling in math. I look at the test paper that is given to me, and I flashback to my very first NSF experience, which was when I was in the first grade. My being just 6 years old, I didn't recognize that this would be a test that would so greatly guide my life. But the ambition and commitment have built up over the years, and by now NSF has become a solid part of my childhood. Do you have a story, poem, essay, or some artwork to share? Please send an e-mail with the attachments to nsf-editor-team@googlegroups.com. In addition to your entry, please send in a scanned copy of your photograph, name of your school and city, your grade level, and your hobbies. Copyright 2003-2014. 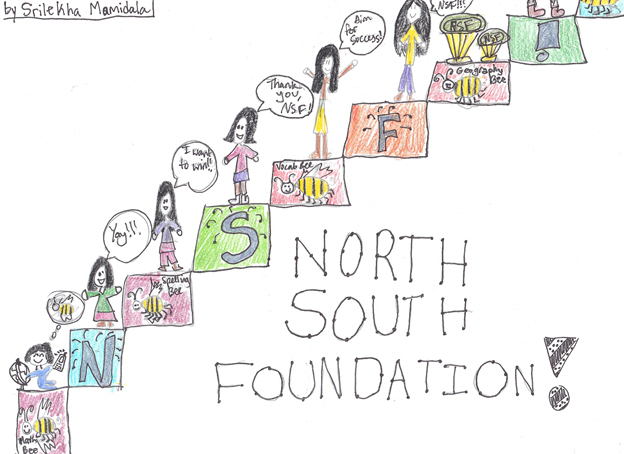 North South Foundation. All rights reserved.